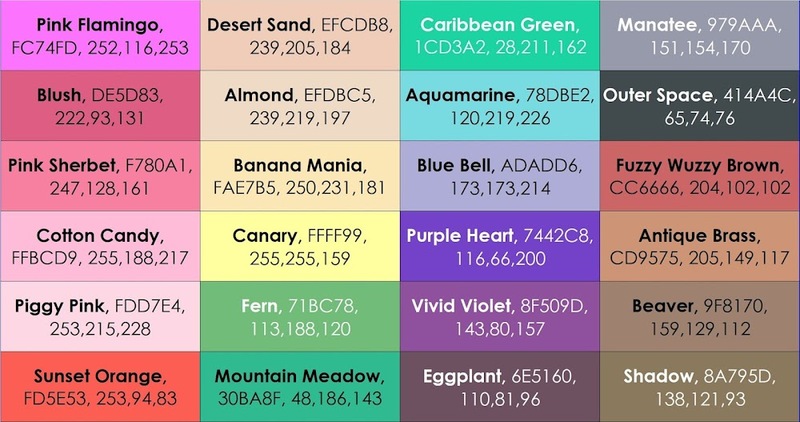 Do you want to know all the current Crayola colors colors? Do you have a favorite color, but do not know what box it comes in? Here are all the colors and the box they 1st come in up to the 152 Count box. Click here to see all the Crayola crayon boxes I have in my collection. To see all the retired colors from Crayola click here. Click here to see all the Colored Pencil colors! Click here to see all the Marker colors! Here are all the crayon colors in all the different crayola crayon box sizes. I started with the 8 count box. The colors in the next box size up are in all the higher count boxes. I specified what colors were added to each box. That way it is easy to see what box needs to be purchased to get a certain color. These are all the current colors, to see the retired colors click here. 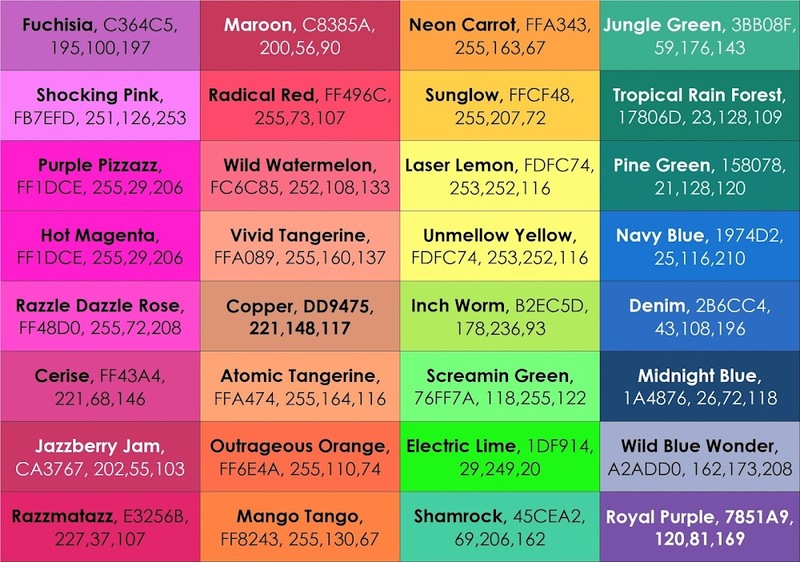 Here are all the Hex and RGB Crayola color values listed alphabetically for the 120 count Crayola crayon box. 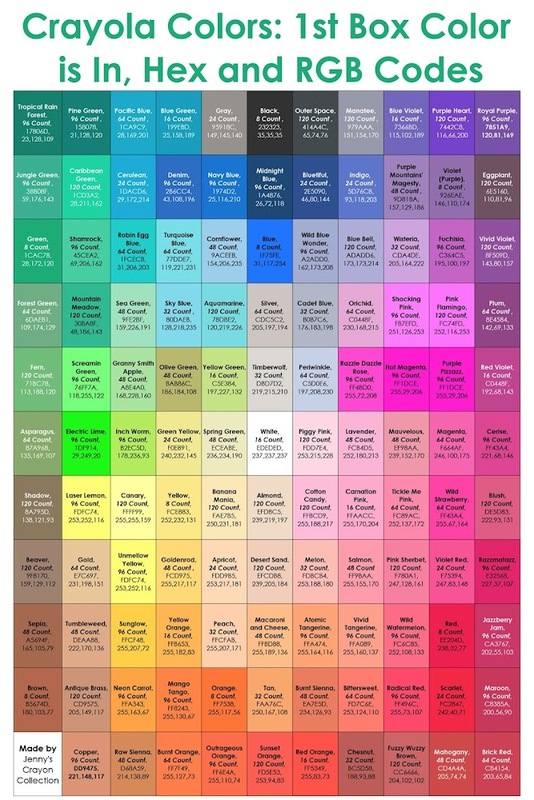 Thanks for the color chart! Now I don't have to guess! You want more glitter crayons? thanks! great help while planning my wedding. 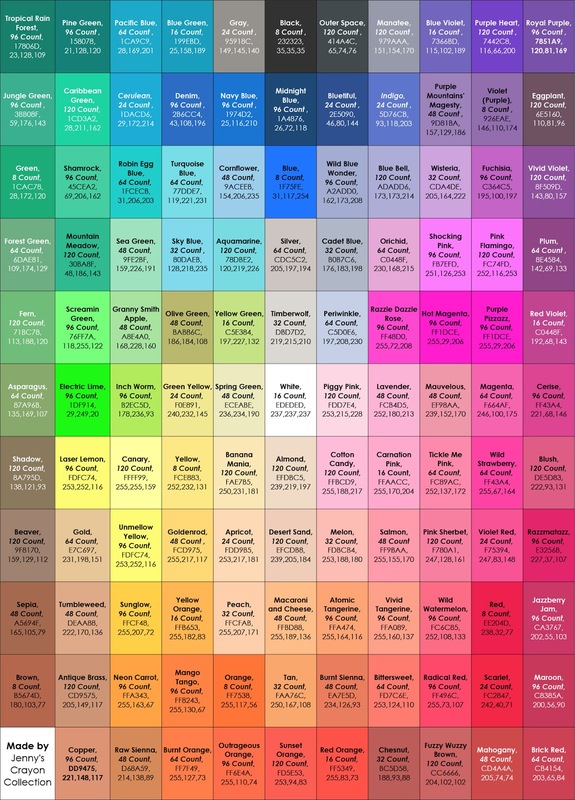 my folks live 3+ hours away, this makes it easier to explain the colors for everything. So glad. Good luck with your wedding! Isn’t coral still an available crayon color? It isn't. It is as a marker and colored pencil I think. Don't forget to add "Bluetiful". Thanks for the help! Thanks for the reminder :) I've been meaning to do that. I need to do that one. That is strange. There is a caveat on the back that said the colors may vary.